Christopher Lee, Jane Horrocks, June Whitfield et al. 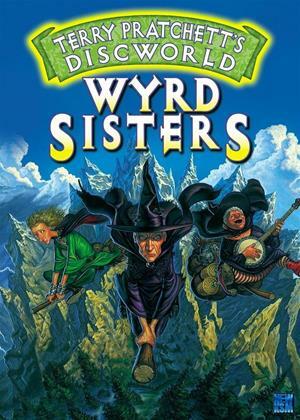 Wyrd Sisters is an animated six-episode miniseries adaptation of one of author Terry Pratchett's Discworld novels. The books offer an alternate reality that has proven irresistible to an avid, international audience - a universe where the world really is flat after all, and is supported by four elephants floating through the cosmos on the back of a giant turtle. It's a world where fantasy conventions have been filtered through an antic, satirical lens that slyly warps the actions and motives of the wizards, witches, monarchs, and knaves that populate them, and it is suggestive of a sword and sorcery counterpart to Douglas Adams' venerable Hitchhiker's Guide to the Galaxy series. Wyrd Sisters retains the verbal wit and colourfully stylised visual terrain of Pratchett's cracked re-imagining of familiar mythological themes, although modest animation techniques relegate its impact to the realm of older TV cartoons. Sci-fi aficionados spoiled by lavish computer graphics and big-screen state of the art will wonder what all the fuss is about; Pratchett's fans, however, won't mind. An intricate plot, set in motion by the murder of King Verence by the utterly dim-witted Duke Felmet, encompasses a smuggled baby, an itinerant theatrical troupe, a kiss lasting 18 years, time travel and other poker-faced twists of fate cohering around the three titular heroines, a coven of rather dotty witches. A droll, sociable Death (voiced by Christopher Lee) epitomises the breezy comic spirit that fuels Pratchett's stories.